Do you want to get started with conversion rate optimisation and start conducting A/B tests but you don’t have the budget to afford the established tools? 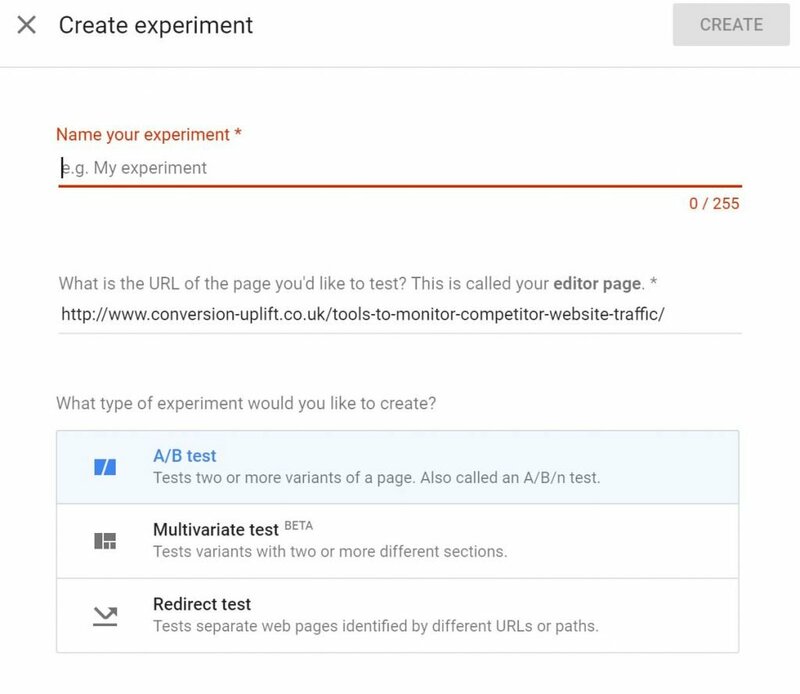 Well, you can now conduct A/B and multivariate tests for free using Google’s new solution, Optimize. Register for free so that you can start conducting online experiments. Find out what does and what doesn’t work on your site and stop having to rely on best practice! Google Optimize is the free version of Google Optimize 360 which is an A/B testing and personalisation platform. Optimize allows marketers to run up to 3 A/B tests (or multivariate tests) at a time and provides a simple to use visual editor that enables a non-technical marketer to set up experiments in a matter of minutes. It also integrates fully with Google Analytics. So, what are the main differences between Google 360 and Google Optimize? Limit on number of tests. Optimize only allow you to run up to three concurrent experiments. 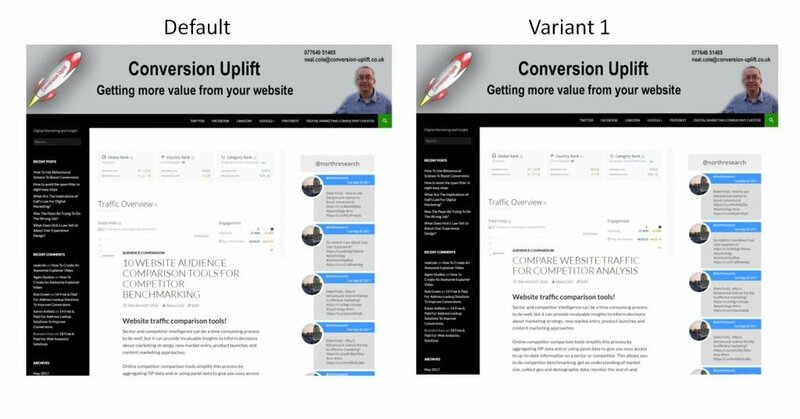 For many small and medium sized sites that have no one dedicated to conversion rate optimisation this may not prove to be a major restriction. I know even large websites that struggle to run more than a couple of tests at once and would save tens of thousands of pounds if they switched to Google Optimize. Optimize allows you to conduct multivariate tests, but it limits you to 16 variations. Again, for many sites this may not be a problem because the more variations you have the more traffic you need to complete the test within a reasonable time scale. No audiences. The free version of Google Optimize does not allow the use of Google Analytics audiences to target which visitors to include in tests. However, there are other targeting features available to use. Objectives have to be pre-set. Unlike Optimize 360 there is no ability to analyse additional goals after the test has been set up. Although this is a useful feature it can lead to lazy thinking as you should have a single success metric linked to a strong hypothesis. How to get started with Google Optimize? Assuming that you already have Google Analytics implementation of Google Optimize is a simple process that looks like this. When you register for Optimize you will be asked to create an account for your business and then a container for each website. You should then link your container (the individual website) to your Google Analytics account as this allows the two tools to share data. I recommend you do this as it allows for analysis of your tests within Google Analytics. To minimise page flickering from A/B tests Optimize also recommends that you add some additional code to each page immediately before the Google Analytics code. You are now ready to set up an experiment and Optimize gives you three types of tests to run. Redirect test: Sometimes called a split test where you test one or more whole new page or path on a separate URL. My example here is an A/B test where I have changed the heading to make it shorter and snappier which also brings more content above the fold. Optimize has a simple to use what you see is what you get (WYSIWG) visual editor which allows you to add, remove or change content. 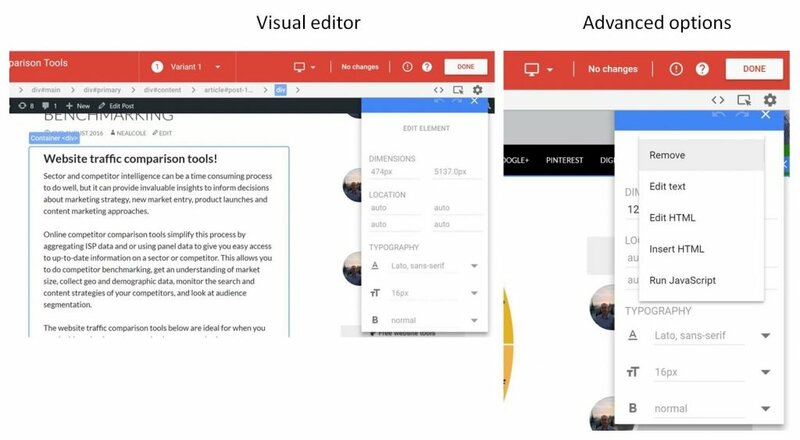 To access the visual editor you will need to download the Chrome extension for Optimize or use a browser that supports CSS3 selectors. You can now create the variant you want to test using the visual editor or specify the URLs you want to test if you plan a redirect test. To make changes using the visual editor click on the heading or container you wish to amend. This will then open up the menu with quick tools to make simple changes to text, typography and orientation. If you select the Edit Element button you will see more advanced options which include Remove, edit text, edit HTML and insert HTML. Make sure you save your changes and confirm you are “Done” to create your variant. Before you publish your experiment you must set your objectives and decide what audience you want to target. If you have linked Google Analytics to your account you can use any goals that you have set up in GA as an objective. Optimize also has Pageviews, Bounces and Session Duration as default objective options. Optimize allows you to select up to three objectives for each experiment. For my A/B test I selected Bounces and Pageviews. You should then decide which users you want to target as this needs to be set before the experiment begins. Click on the “CREATE RULE” button to open the side menu. URLs. Target individual pages and sets of pages. URL targeting enables you to pick the page where your experiment is to run. This allows you to target a single page, a narrow subset of pages, or Hosts and Paths. Behaviour. Target visitors arriving on a site from a specific channel or source. It allows you to target first time users and visitors from a specific referrer. Geo. Target users from a specific city, region or country. When you type in the Values field, you will see suggestions from the AdWords Geographical Targeting API to speed up rule creation. Technology. Target visitors using a specific browser, operating system or device. Optimize tracks the browser’s user agent string to identify which browser a visitor is on, what version and on which operating system. First-party cookie. Target the value of a first-party cookie in the user’s browser. This allows you to target returning visitors who will already have a first-party cookie from your site. Query Parameter. Target specific pages and sets of pages. Query parameter targeting explicitly targets values that occur in the query string of a URL. These are found between the question mark and the hash mark in the URL query string. These targeting options allow you to easily use Google Optimize for personalisation as well as for testing. For example, you could use Optimize to display a different image or heading for new visitors compared to returning visitors. Alternatively you could change the heading or message for visitors arriving from a specific source of traffic or customize text according to the user’s location. To view the performance of your test variants simply go to your experiment and select the Reporting tab in the top left-hand menu. 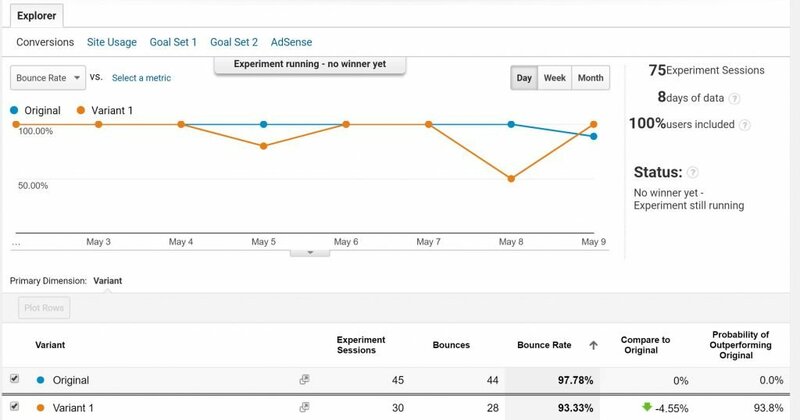 Alternatively you can view results in Google Analytics by selecting Behaviour>Experiments. This provides a simple improvement overview which compares your variant with the original experience. Here we can see that in my headline test variant 1 currently has a 69% chance of being the best performing experience. However, the test had only been running a few days and so it was far too early to make any definite conclusions. Google Optimize recommends that all tests are run for at least two weeks. This allows for the weekend effect as people often behave differently during the week when they are at work compared to when they are at home for the weekend. It is also important to consider how long your business cycle is so that you don’t end a test before a full cycle has ended. After the test has been running a reasonable length of time and you have a sufficiently large sample of users included in the test Optimize will display a definitive recommendation about the test. This is very useful if you are new to testing. For a free tool, Google Optimize is a powerful and easy to use A/B testing engine that will meet the needs of most small and medium sized websites. It is by far the best free testing solution currently on the market and it has most of the functions and capabilities of paid for solutions. It allows companies with small or even non-existent budgets to conduct tests and begin to personalise their user experience. Google Optimize may be a game-changer as far as A/B testing is concerned. Expect to see more organisations begin to run tests and experiment with personalisation. Given the cost of some paid for solutions I would expect some organisations will consider switching to Optimize. If their current testing solution is not being fully utilised they could potentially save thousands of pounds a year by switching to Optimize. Importance of web analytics – 18 Free & Paid Web Analytics Solutions. Types of A/B tests – How to use A/B testing to optimize your website. Strategy – How should you prioritise your A/B test ideas? Thank you for reading my post and I hope it has inspired you to create a Google Optimize account and start running experiments and test personalisation on your site. If you found it useful please share using the social media icons below.